Ghost Ship Octavius is a musical experience that brings incredible music and ghostly frozen imagery together in one awe-inspiring package. While “metal” or “rock” may be a suitable genre for the band as a whole, Ghost Ship Octavius is more than those genres can encompass. The band and it’s art is truly unique. Starting with their first release in 2015, the band had wide success across many audiences abroad. Many cities in the US and Canada saw the first tour, and were blown away by the combination of music with the visual atmosphere of frozen snow and fog that Ghost Ship Octavius brings to the stage. It was clear that they had something special. Soon after, GSO played Prog Power USA and the 70,000 Tons of Metal cruise, and was again widely received with enthusiasm and praise. 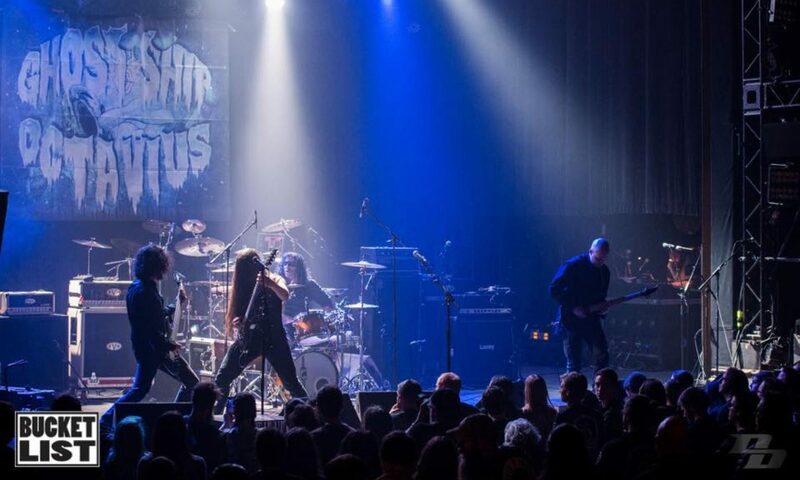 In 2018 Ghost Ship Octavius did a full-length US/Canada tour with bands TYR, Orphaned Land, and Aeternam. The tour was a huge success and brought the music to more places yet unfamiliar. Now, GSO is on their second full-length release “Delirium”, which ventures into new and exciting musical territory, and continues the theme of the band and their aesthetic into a whole new world! Just recently released, the album contains many gradients of music from rock, metal, prog, and other genres. Matthew Wicklund endorses: Caparison Guitars, DiMarzio Pickups, EVH Amplifires, Atomic Amplifiers and Swiss Picks. Van Williams uses and is endorsed by the following: Pearl Drums, Sabian Cymbals, Evans Drumheads, ProMark drumsticks, Toontrack software, Tru Tuner, uses RODE microphones.